Every runner, including the world's fastest man this year, was disqualified in a bizarre 400m heat that made athletics history on the second day of the world indoor championships in Birmingham on Friday. 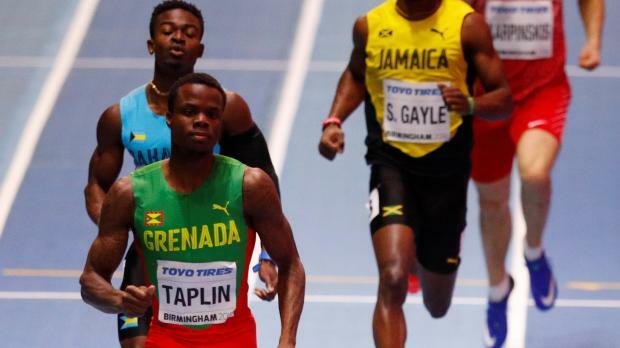 Bralon Taplin was among the casualties after appearing to qualify for the semifinals later on Friday by winning the third heat comfortably in 46.37sec. But the Grenadan was ruled to have run out of his lane, along with the other three finishers, Jamaica's Steven Gayle, Latvia's Austris Karpinskis and Alonzo Russell from the Bahamas. Another runner, Qatar's Abdalelah Haroun, was earlier red carded for false starting in the same heat. All decisions were subject to appeal. There was no such drama in the final heat when Pavel Maslak eased though, qualifying behind Spain's Oscar Husillos as the Czech indoor specialist attempts to become the first three-time 400m champion at the event. In the women's 400m, Americans Courtney Okolo (51.54) and Shakima Wimbley (52.43) both qualified comfortably, along with Switzerland's Lea Sprunger (52.46), who is expected to be their main rival. Double Olympic sprint champion Elaine Thompson also eased through to the later stages of the 60m, posting 7.20 to finish behind Marie-Josee Ta Lou from the Ivory Coast, who continued her recent good form to win the heat in 7.17. Thompson, who won bronze at the 2016 indoor world championships but has yet to replicate her best form of last year, appeared composed in making it through in what is shaping up to be one of the championship's most hotly contested events. While Dafne Schippers, from the Netherlands, accelerated steadily to win her heat comfortably in 7.19, US national champion Javianne Oliver was slowest off the blocks in the first heat, looking sluggish in posting 7.29 to finish third behind Norway's Ezinne Okparaebo. The 23-year-old ran the world's best this year of 7.02 at altitude but showed her inexperience at this level in only just making it through. France's Carolle Zahe posted the fastest time of 7.11 in winning Heat Four. "It's an honour for me to run with the top sprinters and I hope I'm getting better through the weekend," said Zahe. In the heptathlon Kevin Mayer took a strong grip on the gold medal as he seeks to establish himself as the true heir to Ashton Eaton. The Frenchman recorded personal bests in the 60m and shot put, and recorded a solid long jump, to lead Canada's Damian Warner by 45 points after three events. In the 3000m, Ethiopians Yomif Kejelcha and Selemon Barega won the heats ahead of Sunday's final. Amid continued bad weather outside the arena, the organisers blamed empty seats on the closure of local schools, who had been allocated tickets. "Unfortunately, due to adverse weather conditions, the majority of the schools in Birmingham and across the region are closed today and so the schoolchildren, along with the other spectators who aren't able to travel, won't be able to join us today, a statement from the Local Organising Committee said.